This area occupies an important place in the cultural history of Rajasthan. It was closely associated with the ancient kingdom of Matsyadesa. During the 5th and 4th centuries BC, the region covered by Bharatpur, Dholpur and Karauli formed part of the Sursena Janpada with its capital at Mathura to the northeast. Many late Mauryan (2nd century BC) sculptures and remains of pottery have been found at Noh on the Agra road cast of Bharatpur and can now he seen in the local museum. Unlike most of Rajasthan, this area is populated by Jats, farmers, who, over much of northwestern India, form the backbone of the agricultural population. They were settled in this region long before either the Rajputs or the Marathas became the dominant powers. In many areas, Jat leaders made marriage alliances with the new overlords, but they continued to harass the Mughal armies and often revolted against the Rajput princes. During the late 17th century, a Jat headman from the Sinsinwar family called Churaman formed a loose coalition of fellow Jats and began systematically to raid the surrounding countryside, but the Mughal governor in Agra retaliated and in turn destroyed many Jat villages. Under Badan Singh, the Jats regrouped and by 1752 controlled a large area west of the Jamuna river between Delhi and Agra. The Amber (Jaipur) rulers gave Badan Singh the title of Brij-Raj and in 1725 the building of the fort of Deeg with gardens and palaces was started. In 1732 Badan Singh’s son and regent, Suraj Mal, began work on the Bharatpur Fort and building continued for the next 60 years. The Bharatpur Fort was, perhaps, among the most formidable in India at that time and in 1805 Lord Lake unsuccessfully laid siege to it for four months and had to retreat after suffering the largest losses experienced by the British in India up until then. Maharaja Ranjit Singh took advantage of this and Bharatpur was the first state in India to sign a treaty of “Permanent Equal Friendship” with the East India Company. Throughout the 19th century Bharatpur remained at peace and this continued till Independence came to India. In 1948, four princely states, Alwar, Bharatpur, Dholpur and Karauli, formed the Matsya Union with the Maharaja of Dholpur as Rajpramukh and in May 1949 the Union joined the new state of Rajasthan. The local language around Bharatpur is the Braj Bhasha dialect of Rajasthani while south, toward Karauli, the Dang dialect is more widespread. As with most of northern India. festivals are celebrated throughout the year and a few have particular local significance. 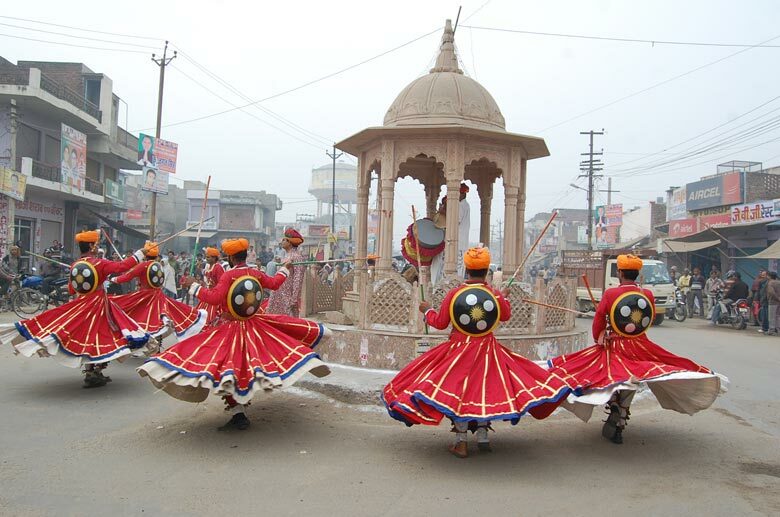 The Ram-lila performances are most impressive and, while principally performed during Dussehra, are also sometimes performed at other more local festivals. Bharatpur is close to the Braj region of Lord Krishna’s birth and childhood. The Ras-lila depicting the life of Krishna is performed by professions drawn from the Rai community. During the Narsingh Chaturdashi festival, the dancers and other performers wear masks depicting various gods, saints and demons. The khyal form of rural drama is popular throughout Rajasthan but the nautankis (village actors) of Bharatpur, using a well-build stage and coloured backcloths, have developed their own technique of playing nagaras (kettledrums) and a form of dancing including high, and often violent, jumps, earning the name takhta-tod. The stories depicted are usually centred on the lives of Rama and Krishna. 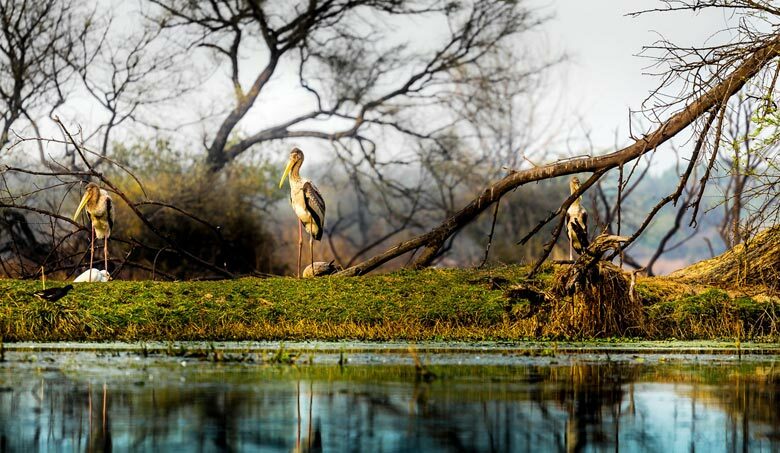 Bharatpur is well located and there is a good road from Jaipur to the west and the 150 km (115 miles) can be covered in about 31/2 hours. To the east is Akbar’s capital, Fatehpur Sikri (18 km/ 11 miles) and Agra (50km/32 miles). To the north, Delhi is only 184 km (125 miles) away. Besides being at the hub of an excellent road network, Bharatpur is a junction of the main Delhi—Bombay railway (with connections to Sawai Madhopur and Kota to the south) and the line running east—west between Agra and Jaipur. While most visitors to Bharatpur now visit the area for the nearby bird sanctuary, the Lohagarh Fort is still the focal point of the town. The fort takes its name (lohagarh: iron fort) from its supposedly impregnable defenses. Its ingenious design gave it an awesome reputation. Surrounded by two massive earthen ramparts, each encircled by a moat, the mud walls were so thick that all missiles were absorbed and the inner fort remained intact. The moats were 45 metres (150 feet) wide in part and up to 15 metres (50 feet) deep. Now all that remains is part of the inner mud wall (the original outer wall was levelled in 1826) and the moat surrounding the masonry walls. The outermost wall was originally 11 km (7 miles) in circumference and took eight years to complete. A cannon still points defensively to the northeast from a remnant of the mud and rubble wall. The entrance to the fort from the north is over an ancient brick and stone bridge and through the Assaldati Gate. On either side of the gate are fading murals of elephants. This “Gate of Seven Metals”, possibly belonged to the Sisodia Rajputs of Chittaurgarh but was removed to Delhi by Allauddin Khilji, and the south gate, more often known as the Loha Darwaza (Iron Gate), was brought from Delhi by Maharaja Jawahar Singh in 1764. The old walled city within the fort forms an irregular oblong and the inner fort contains three palaces and many new buildings. Numerous local government offices now occupy parts of the fort. The palace within the fort was, like many throughout Rajasthan, built by different generations. Most of the buildings adopted Rajput and Mughal styles but in simplified forms, reflecting the Jat lack of ostentation. 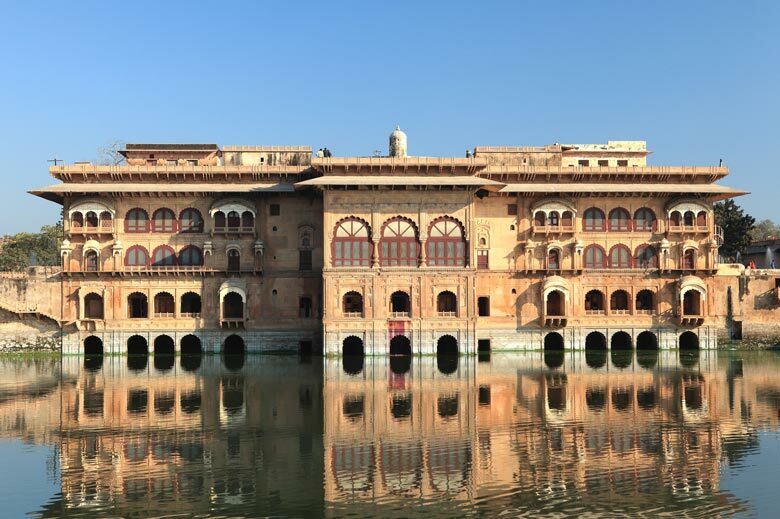 Of the three palaces, the central building is the oldest, being built by Badan Singh. Part of it now houses the museum. The Kamra Palace to the west, some of which is now part of the museum, previously housed the Bharatpur State armoury and treasury. To the east is the raja’s palace or Mahal Khas, including the royal apartments built by Maharaj Balwant Singh (1826-53). The rooms are compact, with stone-latticed windows set in long, arched alcoves. Many walls are still covered with multi-coloured, painted designs. On the ground floor is a set of hamams, sunken baths for both hot and cold water. These rooms with painted walls and domed roofs are, along with the rest of the royal apartments, in strong contrast to much of this otherwise unadorned fort. Primarily an archaeological collection, this museum was founded in 1944 by Maharaj Sawai Brijendra Singh. 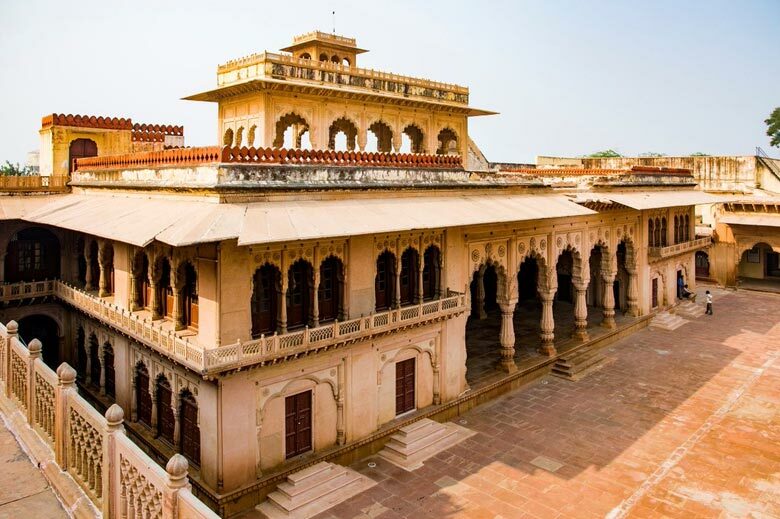 While overshadowed by the older and better known collections at Mathura and Agra, it is certainly worth visiting. It has some interesting sculptures, including a late Gupta Shiva-Parvati from the 8th century, a Jain tirthankara dated circa 1020 and a 10th-century Ganesh. One of the most interesting pieces is a 2nd-century red sandstone Shivalinga. From the nearby village of Noh are terracotta toys from the 1st to 3rd-century Kushan period. Two other places of interest within the fort are its bastions. The central tower known as the Jawahar Burj was built in 1765 to commemorate a successful assault on Delhi. The coronation ceremony of the maharajas of Bharatpur took place here and nearby is an Iron Pillar about 30 cm (12 inches) in diameter with the names of the rulers from the time of Lord Krishna to the present inscribed on it in Hindi. The other tower, known as Fateh Burj, was built to remind the fort’s inhabitants of the successful defence of Bharatpur from the British attack in 1805. The villages of Noh, a few kilometres to the east, and Mallah to the south, have both produced interesting archaeological finds, many of which are now in the museum. At Noh a 2-metre (7-foot) high yaksha sculpture of the Kushan (1st century AD) period was found, similar to the one in the Mathura museum. About 40 km (25 miles) southeast of Bharatpur, at Rupbas is a 8-metre (27-foot) long sequence of rock-cut images showing “Baldeoji, his con-sort Reoti, Lakshmi-Narayan and the Pandava hero Yudhishthira with Vishnu”. The now ruined, but still attractive palace and tank at Rupbas was used as a shooting lodge by Akbar on hunting visits from Fatehpur Sikri. The road north of Bharatpur goes via Kumher to Deeg (34 km/22 miles). Kumher was founded by Kumbi Jat of Sinsini and was at one time the second capital of Bharatpur State. Badan Singh in 1722 built the palaces and many of the fortifications which are now impressive ruins to the east of the road. The now small and dusty village was in 1754 the site of an important siege when Suraj Mal withstood a combined Mughal and Maratha army of over 80,000 men. During the siege, one of the opposing generals, Khandeo Rao Holkar, was shot and, with his typical generosity, Suraj Mal later built an impressive chatri (cenotaph) in his memory at the spot where he fell. Deeg is now a small agricultural town with a busy, dusty market. It is also approachable from either Kosi or Mathura (36 km/23 miles) on the Delhi—Agra highway. Any visitor going by road from Delhi to Bharatpur is well advised to take the slower (and slightly rougher) road via Deeg. When approached from the south, the massive fortifications divert the road. The fort forms part of the town’s fortifications and massive masonry walls tower up to 28 metres (85 feet) above a moat 17 metres (55 feet) wide. The fort has 12 bastions, the largest on the northwest corner, known as Lakla Burj and still mounted with cannon. The only gate is on the northern side and within the fort today still lie some locally cast guns and a partially ruined, simple haveli. 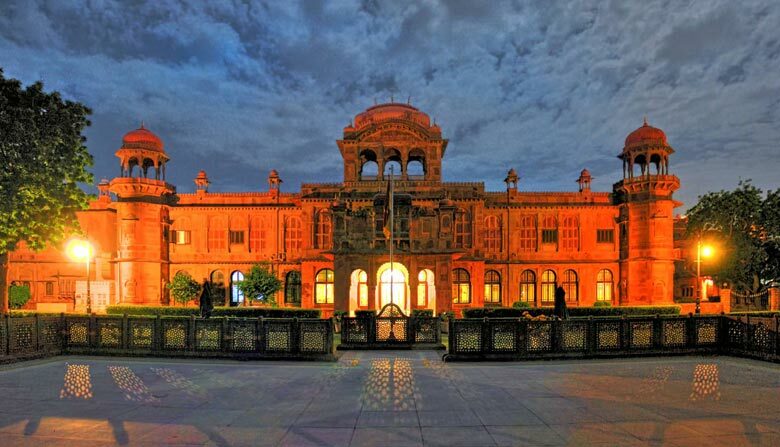 Deeg is justly known for its palaces and gardens begun by Badan Singh and laid out by Suraj Mal following the tradition brought to India by the early Mughals. The palace pavilions and gardens are laid out with an excellent sense of balance. The present area is probably only half of what was originally planned. However, what was built is exciting and well preserved, with the buildings forming a large rectangle enclosing the gardens and two large tanks at the eastern and western ends. The largest and most impressive building, Gopal Bhawan, was built around 1763 and overlooks the Gopal Sagar (tank) to the west. It is flanked by two smaller pavilions (Sawan and Bhadon — named after the two monsoon months) which purport. in their curved roofs and pillars, to simulate a large pleasure barge, and is fronted by two marble thrones with the gardens beyond. Seen from the garden, Gopal Bhawan seems only two storeys high while, actually, two lower levels also overlook the water. Many rooms in Gopal Bhawan have their original furniture and .ince few tourists visit Deeg, it has been possible to maintain the palace very much as it was when the maharaja and his family occasionally stayed here up to the early 1970s. On the northern side of the garden is a large audience hall known as Nand nhawan, while opposite, to the south, is Krishna Bhawan. The focal point of the garden is the pillated summer pavilion (Keshav Bhawan) with its ingeniously designed waterworks overlooking Rup Sagar to the cast. Five hundred fountains, many of which still play during local festivals, used to spout coloured water on special occasions against a backdrop of lavish firework displays. At the southwestern corner is Suraj Bhawan, completed by Suraj Mal’s son, Jawahar Singh (1764-68). Unlike most of the other buildings which use cream-coloured sandstone, Suraj Bhawan is built of white marble, decorated with a mosaic and inlay of semi-precious stones. Much of this marble, including the inlay, was probably looted from Delhi. 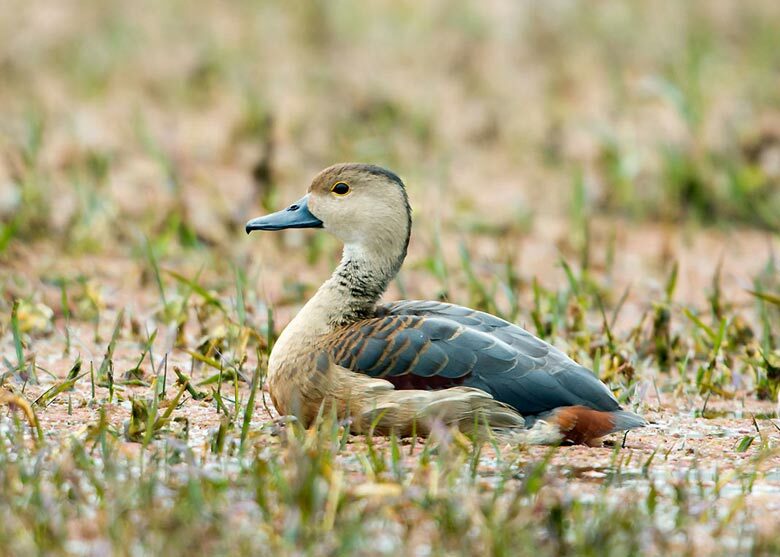 For more information about Bharatpur Rajasthan contact Swan Tours one of the leading travel agents in India.